We’re inching closer and closer to summer (yay!) and as I’m making my plans for my kids’ summer break from school, I’m looking to come up with some screen-free activities to keep them occupied. I was recently sent a selection of activity books from Quarto Books that look perfect for busting boredom and having some fun. Pick up some of these for summer vacation and road trips – there’s even one that’s perfect for plane rides! Using simple sticker shapes, children add all their favorite animals to the farmyard—cats, horses, pigs, sheep, cows, rabbits, goats, and chickens…there’s even a goose on the loose! 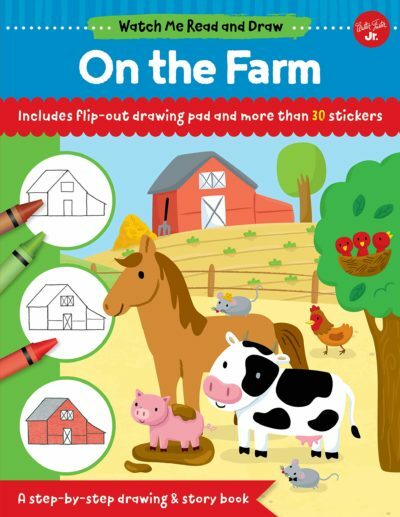 Featuring 20 ready-drawn background scenes to populate as well as seven sheets of draw-on stickers, Sticker Shape Draw: On the Farm is a super-fun creative package—all children need to bring are pens or pencils and their own imaginations. 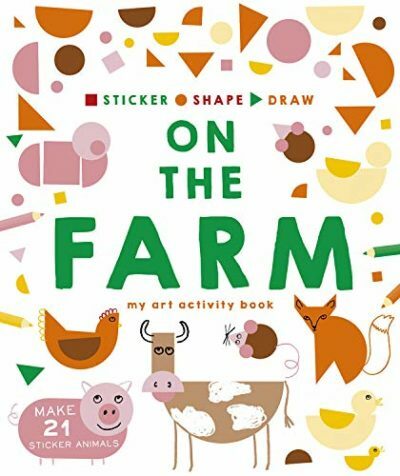 Packed with engaging farmyard characters to construct and decorate, Sticker Shape Draw: On the Farm will keep kids (and parents too!) busy stickering and drawing for hours. Use simple sticker shapes, children add all their favorite machines and vehicles to the scenes provided—diggers, jet planes, cars, sailboats, trucks, trains and buses… there is even a rocket and a hot air balloon! 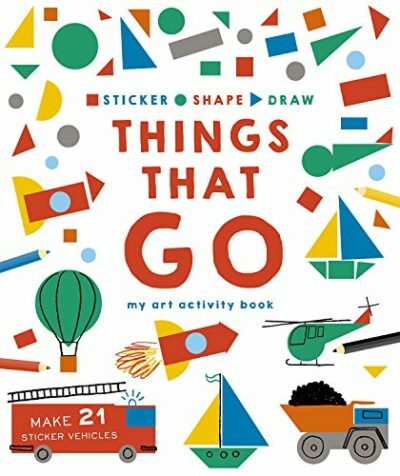 Featuring 20 ready-drawn background scenes to populate as well as seven sheets of draw-on stickers, Sticker Shape Draw: Things That Go is a super-fun creative package—all children need to bring is pens or pencils and their own imaginations. Packed with exciting vehicles to construct and decorate, Sticker Shape Draw: Things That Go will keep kids (and parents too!) busy stickering and drawing for hours. It’s time to get busy with machines that roar, whizz, vroom, and zoom! 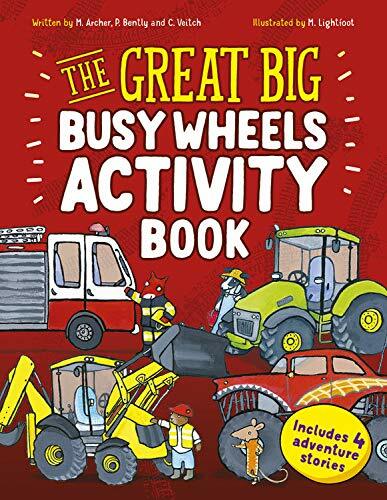 This action-packed activity book is crammed full of things to find, amazing vehicles to color, and games and puzzles to entertain. Perfect for rainy days, offering both entertainment and educational value. Activities appear alongside entertaining adventure stories to engage and delight young vehicle lovers. From rescue vehicles to monster trucks, the stories feature a popular vehicle as the central character, and involve a group of animal characters in a supporting role. The activities use plots and themes from within the stories, encouraging reluctant readers to engage with the text and find out what happens next. Can the busy vehicles save the day? Taking a flight is always exciting, and this activity book is the perfect companion for your journey. Play “I Spy While I Fly,” complete a “pilots’ eye view” scene, take a multiple-choice quiz, and fill in the speech bubbles in a comic strip story. 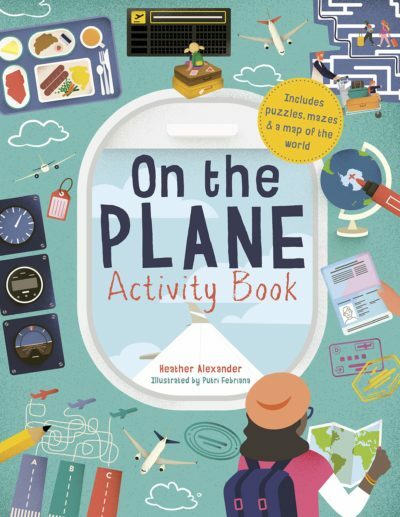 Packed with plenty to keep kids occupied at the airport or during the flight, this book also includes planes to decorate, matching games, fill-in-the-face drawing tasks, true-or-false airplane and flying facts, and behind-the-scenes diagrams to explore. We all love vacations, but getting there can be a hassle. Super Fun Travel Activities to Baffle Your Brain‘s 75 engaging and entertaining puzzles, games, activities, and challenges provide the perfect cure for “Are we there yet?” Hours stuck in the backseat will pass quietly and without complaint! Activities include crossword puzzles, word searches, optical illusion fun, paper & pencil games, and more. Most activities need only a pencil and a brain! Don’t be surprised if this book ends up coming with you wherever you go! It’s easy and fun to learn to draw, especially when there’s a story to read and lots of stickers. In Watch Me Read and Draw: Dinosaurs, kids will read about Pete the pterodactyl who discovers an egg and sets out to find its parent. 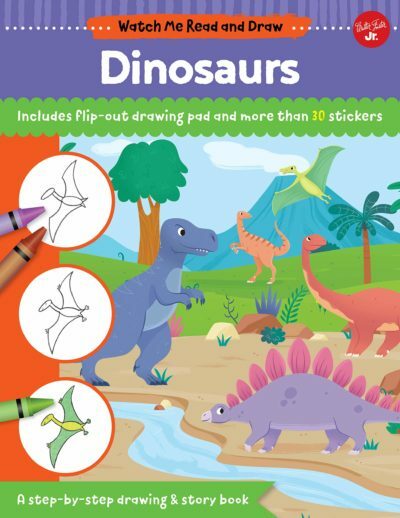 Throughout the story, readers will learn to draw 11 prehistoric pals, step by step, including dinosaurs that roamed the land, air, and sea. Included are drawing instructions for a Pterodactyl, Apatosaurus, Compsognathus, Sauroposeidon, Ankylosaurus, Ornithomimus, Stegosaurus, Tyrannosaurus rex, Diplodocus, Mamenchisaurus, and Triceratops! It’s easy and fun to learn to draw, especially when there’s a story to read and lots of stickers. In Watch Me Read and Draw: On the Farm, a city mouse named Flynn visits his country-mouse cousin to discover everything that happens on a farm each morning. Throughout the story, readers will learn to draw a farm full of friendly animals, step by step. The step-by-step projects in this book will help young artists learn to draw a mouse, baby birds, a cow, a sheep, an owl, a pony, a cat, a pig, and a chicken, as well as a tractor and a barn! Reader Giveaway: One lucky Jinxy Kids reader will win all of the activity books mentioned above. To enter, just complete the entry form below by 11:59 pm ET on 4/22/19. Good luck! “Sticker, Shape, Draw: Things That Go” looks fun! Super Fun Travel Activities to Baffle Your Brain. My nephew would love all of these and I am going on a cruise this Summer. My grandson would love the Get Smarter: Super Fun Travel Activities to Baffle Your Brain! This summer, my plans include going to some of my grandson’s tennis tournaments, so he will be traveling a lot and would love to have these books to keep him entertained. On the plane activity book. Love it! My grandson would really like the Dinosaur book. My daughter would love the On The Farm book. These are awesome books. My grandchildren would love them. My child would like Super Fun Travel Activities! My niece would love Super Fun Travel Activities. Thanks for the fun giveaway! the On The Plane Activity Book. I think my little nephew would enjoy Things That Go. My grandson would most enjoy On the Farm. My son would love the on the farm book! We will be taking a 10 hour road trip this summer so activityare good! 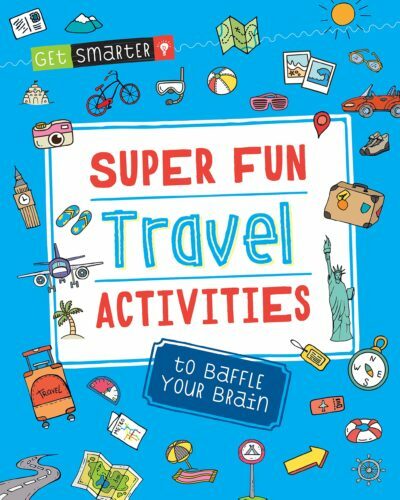 Get Smarter: Super Fun Travel Activities to Baffle Your Brain sounds like an interesting summertime read. These would all be great for our summer road trips! I think my great-grandson would love them all, but Watch Me Read and Draw: Dinosaurs would probably be his favorite. I feel my grandkids will love this. Which of these books my 16 grand-kids and great grand-kids would be most excited to read? Absolutely any and all of them! We just booked our summer vacation to Colorado. That is a direct flight of 3 1/2 hours. These books would be great to win. My nephew will gravitate to Watch Me Read and Draw: Dinosaurs. We will be planning for a milestone birthday and a destination family reunion. Love all the books you selected to give away ! The super fun travel activity book looks awesome! My niece will enjoy the Things that Go book! I think “Things That Go” would be my daughters favorite because it also teaches you to draw. We don’t ahve any plans yet though! The watch me read and draw dinos. We just love dinosaurs! The On the Plane Activity book would be great! One of my plans for this summer is to spend more time outdoors. Thanks for the giveaway! Take a vacation to Fl during the month of June. Wold be helper for all that free time this summer. Thanks for chance. 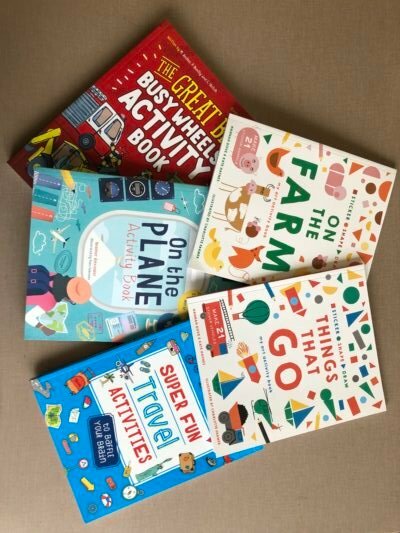 The super fun travel activities book might be just what we need as we plan our motorhome trips this summer with the grandkids! !